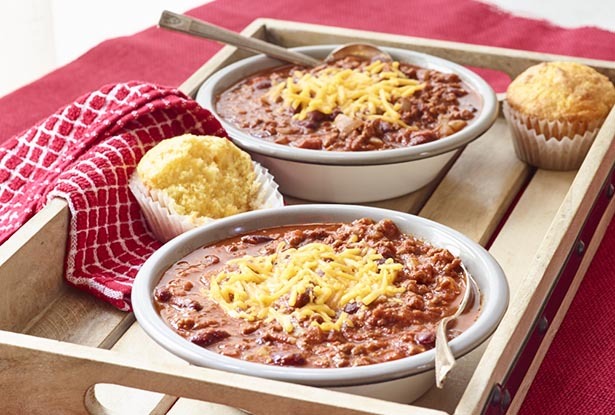 Please family and friends with this hearty chili. Cheesy Corn Muffins complement the chili as a satisfying side dish. In a medium saucepan, cook ground beef or turkey over medium heat, stirring often until brown. Add onion and cook until onion is tender. Add water. Stir. Mix in kidney beans, tomatoes and garlic. Stir in chili powder, paprika, oregano, cumin, salt and pepper. Bring to a boil. Reduce heat to low, cover and simmer 30 minutes, stirring occasionally to prevent burning. Top each serving with cheese. Insert paper muffin liners into muffin pan. Coat each liner with nonstick cooking spray. In a mixing bowl, combine corn muffin mix, eggs and milk, stirring well. Add cheese. Mix thoroughly. Allow batter to sit 2-3 minutes. Bake 15-20 minutes until golden brown or until a toothpick comes out clean.